Finally have grown my own nails long enough to do pokenails again. Here is some and also results of the growing. 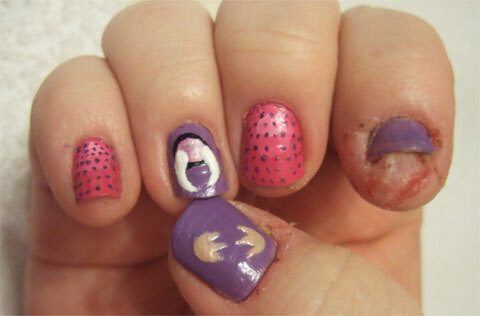 After getting my nails ruined with too much fake nails usage (in a row) + quit drinking milk = not getting calcium. I started taking calcium in the beginning of the year and now biotin for couple months or something. I normally never got my nails this long, they always rip on the edges, now i have only ripped my (left) index finger nail once. They also feel stronger. The surface isn’t that smooth yet what i would like it to be, but it think it will also eventually even out. I have sanded the worst out of it, but i don’t want it to get too thin, so not much. But more pokenails! Butterfree, Venonat, Trapinch, Squirtle and Bronzong this time. I actually totally forgot that i couldn’t do big eyes on my right hand, and i realized it during painting it. 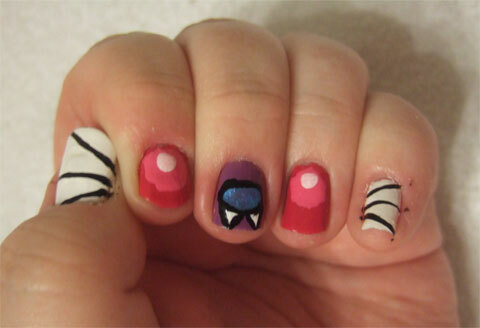 So I just moved the pattern one nail towards the pinkie pie. So there should be placed like Butterfree ones.